I should have clicked, given that Cono Sur’s entry level range of wine is called Bicicleta. It’s a symbol, says Cono Sur, that honours employees “… and represents their commitment to developing a viticulture both in excellence and with respect for the environment.” We were here to see Cono Sur’s philosophy in action. Soon we were in the saddle, some of us whizzing off and some of us (ahem) a little wobbly. First stop was to see the geese. 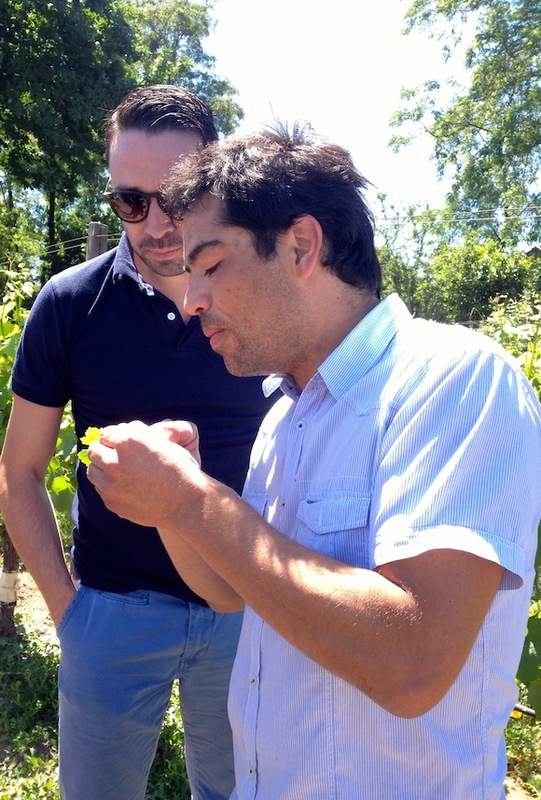 These, explained winemaker Guillermo Sánchez, are natural pesticides. They like to snack on burrito bugs, a South American pest that in turn, likes to munch on vines. Spiders are also encouraged to join in the burrito feast – they’re attracted by the plants growing between the vines. Some would argue that these plants compete with the vines for nutrition. “The idea is not to look like a hospital. Biodiversity is the concept,” said Guillermo, showing us how to inspect a leaf for pests. If both these natural solutions fail, then mineral oil is used which, apparently, is allowed under organic regulations. But the aim is to use as few chemicals as possible (if any). New vines, for example, are given an energy drink comprising grape pomace (the left over grape solids after fermentation), manure, milk and corn. All rotting quietly, ready for use, in a pool that honks (like the geese) if you stand too close. The Santa Elisa Estate was the first vineyard purchased by Cono Sur, which now owns sites throughout Chile. The first Pinot Noir vine from Europe was planted here, back in the 1990s. 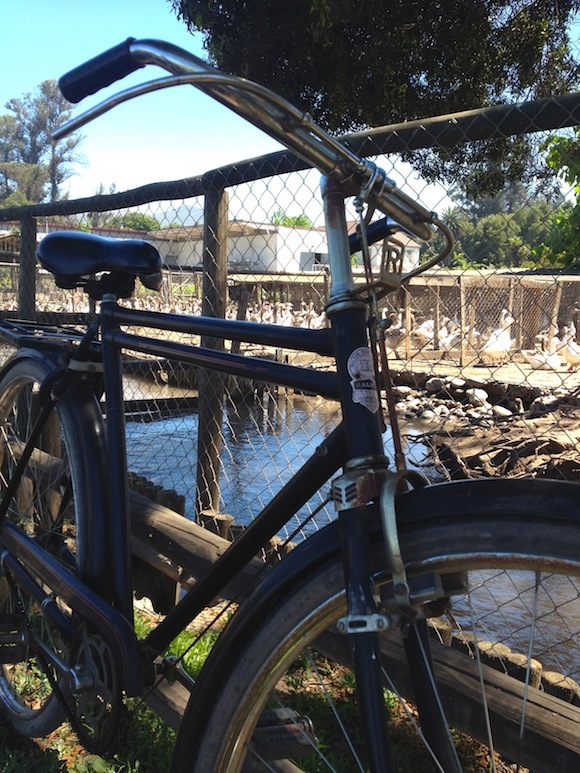 Cycling around the vineyard in the Chilean November sunshine, leaping off our bikes to look at plants and geese, it was easy to forget how big a producer Cono Sur actually is. There are five winemakers, multiple brands and, according to Guillermo, the winery attached to the Santa Elisa estate in Chimbarongo handles 20 million litres of wine each year. That’s enough to fill 26 million regular bottles. While it would be easy to dismiss our vineyard jaunt as a PR exercise to make us feel good about the brand, Cono Sur’s efforts in trying to make mass production sustainable shows this is more a gesture. I may not be a fan of all their wines, but I’ve always admired how they’ve presented themselves to the world in terms of packaging, marketing, consumer messaging and engagement. Slick but personable. 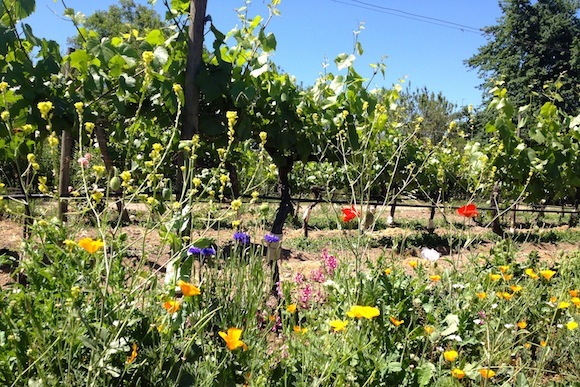 Despite the sustainable approach, the wines are pretty much conventionally made. No funky smells here, thank you very much. And, of the wines tasted after our cycle tour, I felt the Organic Sauvignon Blanc 2013 and the Pinot Noir 2012 (made from grapes on the Santa Elisa estate) were the weakest of the bunch. The latter was a surprise because Pinot Noir is where Cono Sur usually excels. 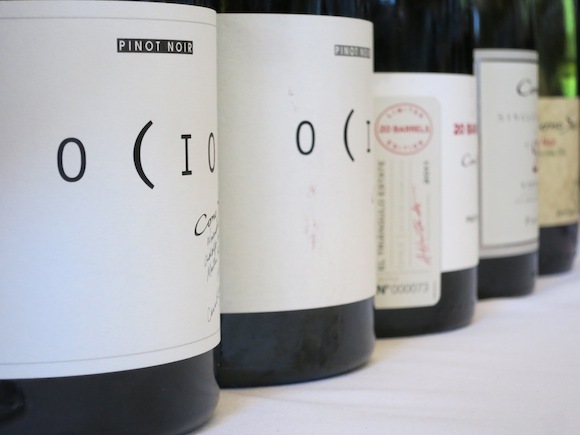 While the silky, intense, structured Ocio 2011 is Cono Sur’s super-premium Pinot, it was the 20 Barrels Pinot Noir 2011 which really impressed. I’ve had earlier vintages of both before, but the latter, in particular, was really showing well on the day of my visit. For about £20 a bottle on the supermarket shelf, it delivers a lot. Ripe red fruits, underpinned by some earthy, savoury, peppery complexity. The grapes for both of these wines are grown in the Casablanca valley. I think Cono Sur’s other strength is Riesling from grapes grown in the cooler, southerly Bío Bío Valley. I’ve enjoyed Maiden Flight Reserva Riesling, with its intense lime and mandarin character, on a number of occasions and thought the Cono Sur Single Vineyard Riesling 2012 was the best white at the tasting. They also make a pretty decent Sparkling Rosé Brut, which we drank with our evening barbecue (and the team is working on extending the sparkling range). Later, relaxing by a post-dinner crackling fire in the open courtyard of the estate’s house, I thought of how, too often, I am guilty of being snobbish about big wine brands. My lazy assumption is that they’re usually responsible for boring, unchallenging wine churned out to be discount fodder for the multiples. Then I think about brands like Villa Maria of New Zealand and Cono Sur who, despite their size, still make you feel like they are more Davids than Goliaths. Their wines, in the main, are good. Sometimes very, very good. And if it weren’t for them showing me 15 years ago that there was a value alternative to poorly-made European plonk, then I probably wouldn’t be the wine geek I am today. 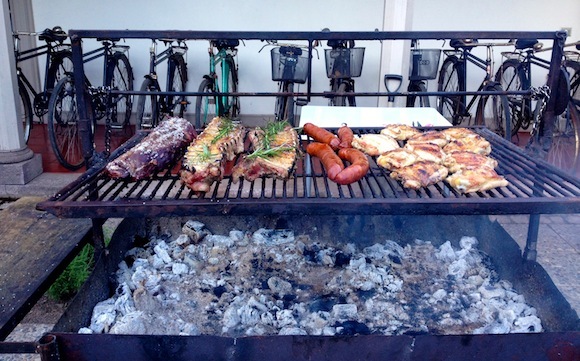 I travelled to Chile courtesy of Concha Y Toro who own Cono Sur. Most of Cono Sur’s wines are easy to find with a quick Google search or check www.wine-searcher.com .